The National Society of the Daughters of the American Revolution was organized October 1, 1890. It is headquartered in Washington, D.C., and is a non-profit, non-political volunteer women's service organization dedicated to promoting patriotism, preserving American history, and securing America's future through better education for children. Our state proudly has the South Carolina State Society of the National Society of the Daughters of the American Revolution web site. Our local DAR organization is the Kate Barry Chapter. Margaret Catherine "Kate" Moore was born in 1752, and she married Andrew Barry in 1767 at the age of fifteen. The two settled in Spartanburg County across the Tyger River, about two miles from Walnut Grove. Kate Barry was an excellent horsewoman, and she was very familiar with the wilderness and Indian trails around her plantation. When the Revolutionary War broke out in 1776, Kate volunteered for the cause as a scout for patriot bands in the area. Her scouting operations were carried out mostly in the portion of Spartanburg County drained by the three Tyger Rivers. Her husband, Andrew, her brother, Thomas Moore, and several brothers-in-law were members of the patriot forces. It was not unusual for Kate to mount her horse, ride to the patriots' encampment, and warn her husband and the troops of impending danger. In the winter of 1781, Kate acted as a voluntary scout for Daniel Morgan, and she gathered patriot bands to send on to him. 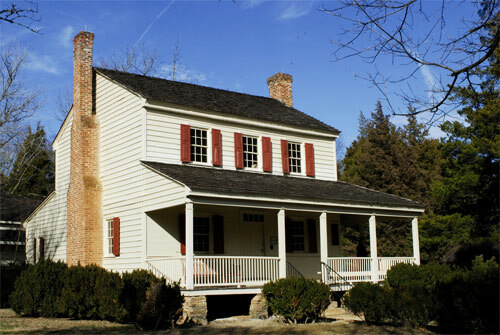 Her husband, Andrew, was a soldier under the command of General Pickens in the victorious Battle of Cowpens. 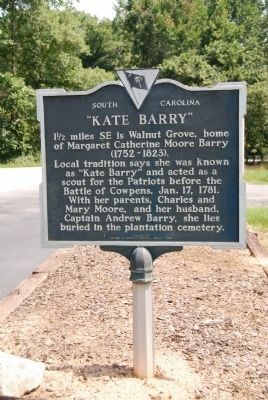 For her efforts to increase the number of American patriots at the Battle of Cowpens, Kate Barry earned her reputation as the Heroine of the Battle of Cowpens. The name of Kate Barry is also surrounded by a tradition of other heroic deeds. In one of these stories, Kate heard Tory soldiers coming across the Tyger River near her father's house. She tied her two-year-old daughter, Catherine, to the bedpost, and rode to her husband's unit for help. In another story, the Tories (Americans who supported the British) came to her house and demanded information about the whereabouts of her husband and his troops. When she refused to give them this information, the Tories tied her up and whipped her three times with a leash. In another incident, Kate Barry barely escaped her Tory enemies as she swam her horse across the rising waters of the Pacolet River to safety. Today, the spirit of Kate Barry lives on at her restored plantation home, Walnut Grove . Her patriotic spirit christens the members of the NSDAR in Spartanburg County, as we perpetuate our American heritage with pride and honor. For dates and directions to our meetings, please Contact Us.